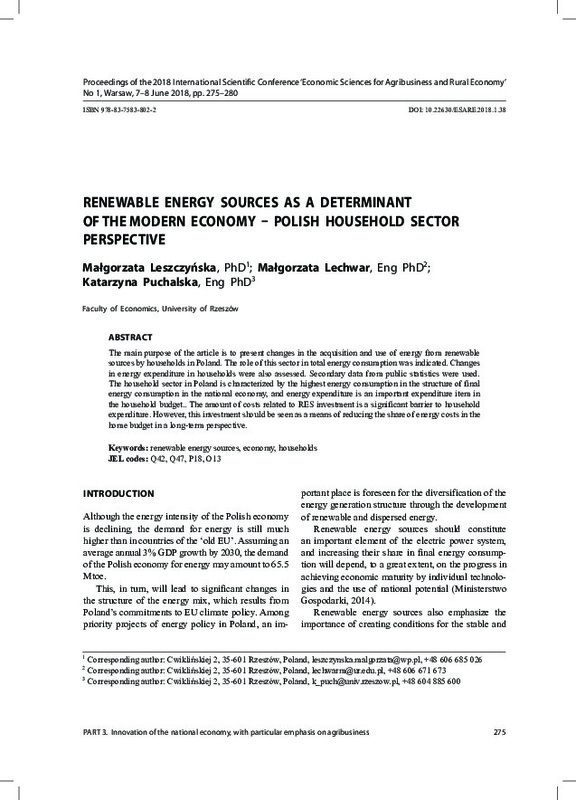 The main purpose of the article is to present changes in the acquisition and use of energy from renewable sources by households in Poland. The role of this sector in total energy consumption was indicated. Changes in energy expenditure in households were also assessed. Secondary data from public statistics were used. The household sector in Poland is characterized by the highest energy consumption in the structure of final energy consumption in the national economy, and energy expenditure is an important expenditure item in the household budget.. The amount of costs related to RES investment is a significant barrier to household expenditure. However, this investment should be seen as a means of reducing the share of energy costs in the home budget in a long-term perspective.